Hand-dipped, hand-decorated and truly unforgettable, these strawberries are the definition of indulgence. 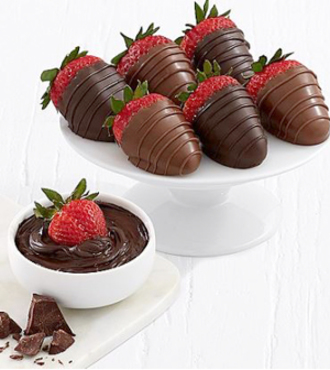 We've taken fresh, juicy strawberries and dipped them in rich milk and dark Belgian chocolate. Each delicious treat is topped with swizzles to create a classic, irresistible gift that' s just right for your favorite chocolate enthusiast.